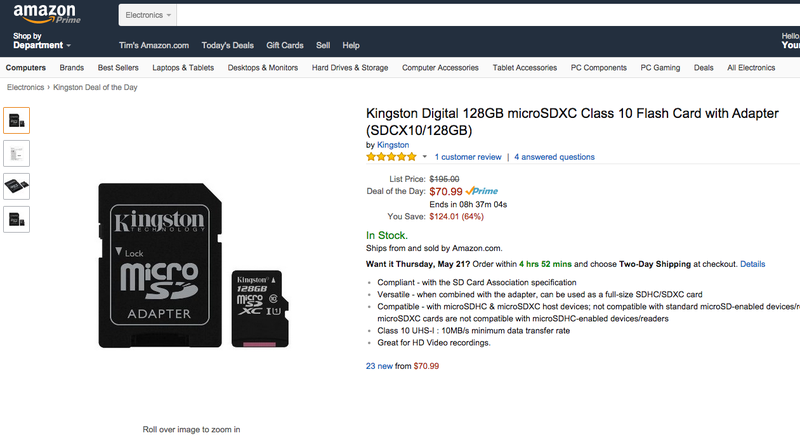 For anyone who needs a new microSD card or some other type of storage contraption, Amazon is hosting a sweet sale on Kingston products right now for up to 70% off. One deal in particular that caught our attention is the 128GB microSDXC card and adapter for $70, down from its regular price of $195. There are also smaller capacity cards, in case your storage needs are not that extreme, such as this 64GB option for just $25. Many smartphones feature slots for expandable storage, allowing owners to bump up the amount of photos or other data they can keep on any given device. Of course, if you bought a new Galaxy S6, none of these options will work for you. Sorry. If you need a new card, click that link below. Giveaway: Win a Ticket to Automatic's Google I/O Party!